The use of high-quality imported pine, the structure of uniform, clear and beautiful texture, shiny bright, durable. High temperature carbonation technology, after 200 ° high temperature treatment, the surface carbonization color, anti-moldy. Color Description: As the display imaging principle and production costs are different, will color aberration. 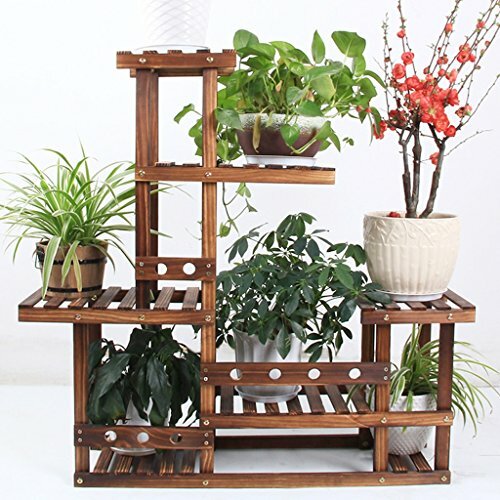 Multilayer: 5 layers of solid wood flower rack, can be placed in a variety of different size flower pots, more layered. Simple operation: steel screws fixed connection, strong and stable,built-in installation instructions, easy to assemble. Perfect storage solution: suitable for any place, balcony, living room, outdoor and so on.